"You stand there with your skill, patience, and something even more unique - and you feel alone. It is a critical point in your life; you are afraid, yet you want to go ahead and do it. Certainly the odds are against you. Most of the critics are concerned with art trends, 'forms', marketing. 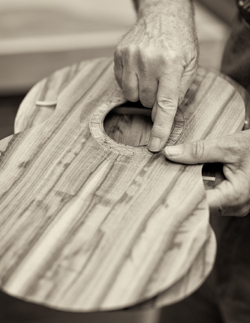 Most of them wouldn't recognize a low tone, subtle, and warm piece of wood if they saw it. People will buy second and third hand imitations, the current overstatement, the by-the-roadside-charming. They don't want your quiet, out-of-place message. They are not prepared for it because that sort of thing belies their whole way of living. Most good craftsmen work by themselves, doing all their own work. So if you are a loner, you and your work are different from most. Accept that, and be glad. Either you are the competitive, speculating sort, or you’re not. And if you aren’t, then turn this fact into an asset; it can be the greatest asset of all. Realizing it helps you to stop being afraid and allows you to be proud of living with what you do best. Stick to what you believe in; go into the work and listen. Forget about competition. Find a pace and a balance that make sense out of long hours. Try to reach the level where there is no competitor except excellence itself." I'm an intuitive and experimental builder. I start with what I've learned from other luthiers, then I experiment with methods until I find something that works for me. I understand the more technical aspects of lutherie and I think about those as I work. But my final decisions are intuitive. And my intuitions have served me well. My instruments tend visually more to the sparse than the ornate. From the wood selection to the finish, I work to emphasize the natural beauty of the wood, whether it be an Oregon domestic or an African exotic. Many aspects of my building are a matter of balance. Durability must be balanced with the sonic responsiveness of the wood. Good instruments are simultaneously light and strong. Priority is given to playability, tone, and aesthetics. In musical instruments, unlike other art, form must follow function. So a beautiful instrument must also be a pleasure to play and sound wonderful. All of my instruments are solid wood. Every top, back and side plate is individually thicknessed for tone and volume. All of my body linings are solid (no kerfs) and laminated; a method that is labor intensive but makes for lighter, stronger, and more rigid sides than kerfed linings. And that rigidity provides the foundation for the vibrating top. All of my neck joints are precisely dovetailed, a joint that is strong even before it is glued. All of my necks have scarf-joined heads and stacked heels, a stronger though more time consuming building method than single piece necks. All of my necks are reinforced with a carbon fiber rod that runs from the body joint to the nut, right behind the fingerboard, a balance of high tech with traditional materials. Tap lightly on one of my headstocks and the body will ring with a musical tone. Most of my necks are laminated of multiple wood species. Every instrument is built, start to finish, by me alone. Before I made instruments I engaged in a natural sequence of carpentry, home repairs, cabinet work, furniture, and decorative box making. I built my first musical instrument, a tenor ukulele kit, in early 2012. It was a natural progression from a lifetime of handiwork; growing up with an engineer and do-it-yourselfer father, building a house when I was 25, and my obsessive desire to repair anything mechanical and everything wooden. Instrument making hooked me because it combined my pleasure of creating, my skills in building, my interest in music, my appreciation of art, and my love of hands-on processes. I tend to immerse myself in my endeavors and instrument building has been no exception. I've been "all in" from the start. In 2012 I studied Guitar Building at The American School of Lutherie with Charles Fox. In 2013 I studied with Robbie O'Brien at O'Brien Guitars. In this 7 day class I watched Robbie build a classical guitar. I was the only one in the class, so I was able to ask lots of questions and help a little with the project. This is the guitar that resulted. In 2015 I studied setup and repair at The American School of Lutherie with Charles Fox and Kerry Char. Plus many, many books on lutherie, online research, luthiers' forum participation, and personal experimentation. My education is ongoing. The Guild of American Luthiers, their publications, and their events are a never ending source of information and inspiration for me. My primary goal is to build the best ukuleles I can. Lately some instruments (not mine) have been coming to me for repair, and I rather enjoy that work as well. I also enjoy teaching other luthiers. If our ideas coincide, I'm open to commissions. Your needs, and how I might fill them are too unique to detail here. Call or write and lets discuss how we might work together to make your perfect instrument. If I can't help, I can probably refer you to someone who can. 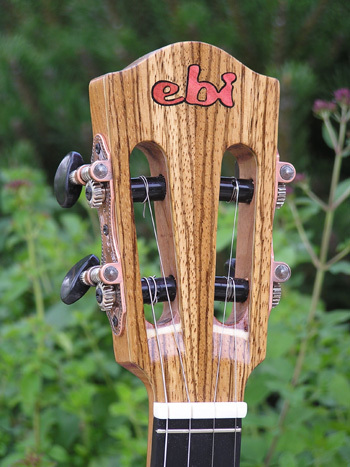 Before there was Ebi Ukuleles, there was Ebi The Dog. You can read her story here: Saving Ebi. 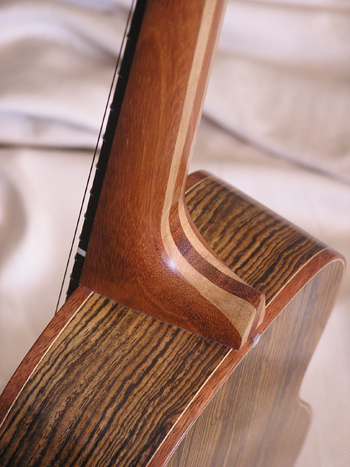 Pictured here is Tenor Ukulele #11. For more views of it and others, please visit my Gallery.